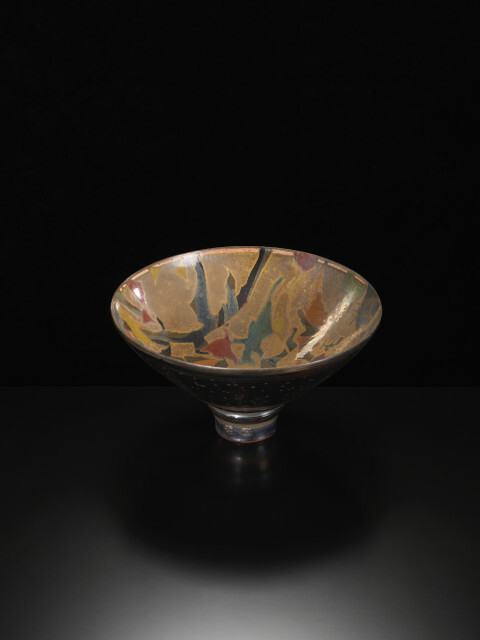 The vibrant, luminous work of Sutton Taylor follows in the long history of lustre glazed pottery, which originated in 9th-century Mesopotamia and is known for its opulence and iridescence. Taylor, however, has made his own mark on this elusive technique, finding the means to create a palette of unprecedented range and richness. Born and brought up in Yorkshire, Sutton Taylor set up his first pottery there in the 1970s, but it was several years before he discovered the ancient art of lustre. Since then it has been the focus of his long and dedicated career, and he has made significant developments in traditional lustreware techniques in the pursuit of new colours, combinations and textures. Lustre is a notoriously exacting and temperamental technique, particularly at the unusually high temperatures used by Taylor to yield the effects he is seeking, and his dazzling pieces are the result of experimentation, experience, instinct and intuition – particularly in the firing process. Since 1995 Taylor has lived and worked in westernmost Cornwall, where the magical light and landscape that inspired some of the 20th century’s greatest painters is also the inspiration for his ceramics. He talks with eloquence about “the drama of the natural world that surrounds me: the meeting of land and sea, the constantly changing light, the great storms, the movement of wind and waves, and the sculpting of the landscape by relentless natural processes”. The current exhibition presents a broad range of thrown vessel forms: generous open bowls, elegant bottle vases, lidded boxes and weighty chargers. The colours he achieves – requiring multiple firings and taking the pots to their physical limits - are breathtaking: rich copper reds and mossy greens, granite greys reminiscent of the rugged Cornish landscape, and iridescent blues flecked with silver like light dancing on the waves. Sutton Taylor is renowned internationally for his beautiful and highly individual ceramics. His work is represented in numerous public collections including the V&A Museum, Los Angeles County Museum, the Alhambra Museum in Spain, the Fitzwilliam Museum in Cambridge and the Ashmolean Museum in Oxford.